The marriage of food and football this morning was a perfect idea, and all the credit goes to my dad. Typically on a Sunday I like to sleep in, but I told my dad I would wake up early and begin cooking with him around 8 a.m. This would give us enough time to make a nice breakfast/brunch just in time for the special football game today in London. 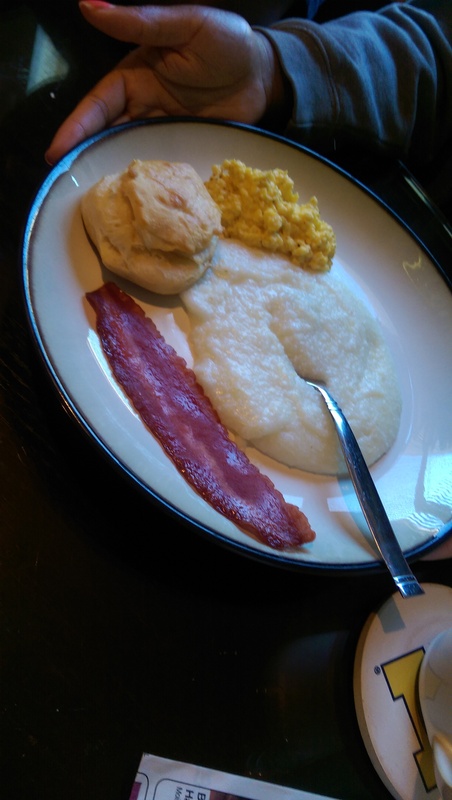 We decided to keep the menu simple: Grits, bacon, biscuits, scrambled eggs, coffee, and bloody Mary’s. It was not only a great meal, but this morning served as a reminder of what cooking is all about: making memories in the kitchen. My dad has always been the cook in the house, and it’s only been in recent years that I’ve decided to join him in the kitchen and cook. That was one of the best decisions I’ve ever made. Whenever my dad and I cook together we end up talking about funny moments from the week, and discussing new ideas. It’s also a time when we learn new cooking tricks/tips (such as how to make PERFECT, and yes I mean, PERFECT scrambled eggs- something my dad admits he’s only mastered as of late).